Dai Greene and Andrew Osagie will face each other in a 600m indoor race at the Glasgow International on Saturday. 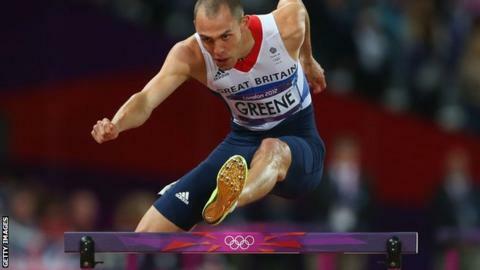 Greene, 26, is the world 400m hurdles champion and Osagie, 24, was a finalist in the 800m at the 2012 Olympics. "This year I will be defending my world title, so it's really important that I hit the ground running with a strong start in Glasgow," said Greene. Osagie added: "The prospect of going up against Dai is something I'm really looking forward to." "I'm really looking forward to getting a full winter's training under my belt after last year's was interrupted, so to compete at this brand new facility in front of a packed crowd is something I'm really excited about," said Greene, who finished fourth in the 400m hurdles at London 2012. "It will be the first time I have run indoors since 2007, but it will be good to test out my strength over a longer distance and see how I match up. After setting a personal best last year, I'm hoping to post a good time in Glasgow to set me up for a big year ahead." The meet will be the first international athletics event to be held at Glasgow's new state of the art 5,000 seat arena. Great Britain's Olympic high jump bronze medallist Robbie Grabarz and world indoor pole vault bronze medallist Holly Bleasdale will also be competing. International athletics stars such as distance runner Bernard Lagat and sprinter Carmelita Jeter of the United States, plus St Kitts and Nevis sprinter Kim Collins are also among those competing. The match will host Paralympic events for the first time in its 21-year history with London 2012 silver medallists Libby Clegg and Stef Reid competing indoors for the first time in their careers. Clegg, who is visually impaired, will compete in the T11/12 60m while Reid, who had her right leg amputated below the knee aged 16, is in the T42/44 long jump. Also on the programme are a women's T37 60m and a men's T46 60m. Details of a Grand Prix series for Paralympic athletes are set to be announced shortly while the IPC World Athletics Championships in Lyon in July are also on the horizon but Clegg believes integrating events into able-bodied competitions is a step towards a lasting legacy. "I think it's definitely going to help Paralympic sport," said the 22-year-old. "At our usual competitions, we don't get many people turning up. That's probably because they are not marketed as well as the able-bodied events. "We like competing in front of a big crowd. You compete to show people what you're capable of and if there're not many people there it's a bit disappointing."